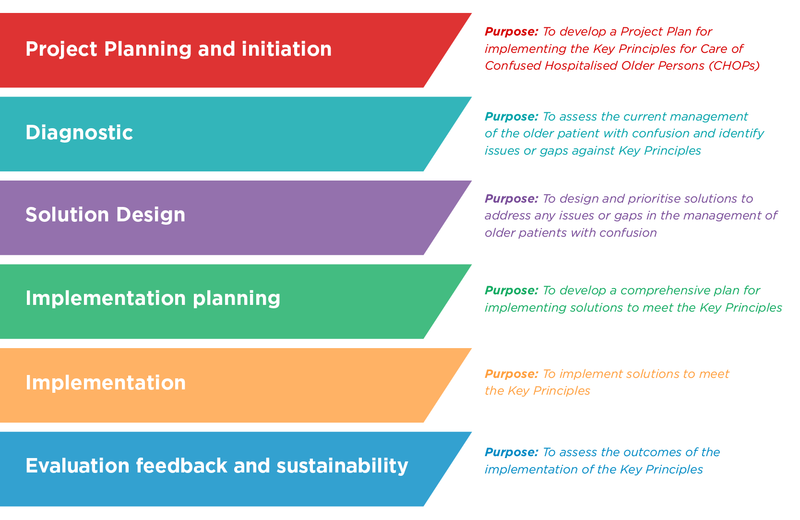 The Agency for Clinical Innovation (ACI) developed the Key Principles for Care of Confused Hospitalised Older Persons (CHOPs) to assist hospitals implement best-practice principles to improve patient outcomes. Implementation of the Key Principles will considerably improve the care and management of older people admitted to hospital with, or developing, confusion. For health care facilities planning to implement the key principles, ACI recommends a structured approach to implement the CHOPs program. This section outlines the purpose of and steps in each phase, with links to ACI resources and contacts for support.